It’s been a terribly busy year in politics in the UK, and whilst we’ve all been busy worrying about Brexit and the US elections our glorious masters have been quietly getting on with business. Doing such things as deciding that our ISP’s must block legal adult sites if they don’t do enough to verify our ages, not matter where they are located. The OpenRights group have a petiton to stop that. However the bill also requires that ISPs record every site you visit for 12 months. Of course if those weren’t bad enough on their own search engines and social media sites are also being put under pressure to “filter” “fake news”. This is a bill that had been defeated before and faced strong opposition but with everyone distracted by other events it was quickly pushed through – proving yet again that eternal vigilance is required. So how did this happen where was the opposition, well we were all busy fighting numerous other battles. “But what” I hear you cry “about the loyal opposition”? Surely with the Conservatives having such a slim majority this can’t have gone through without a fight? 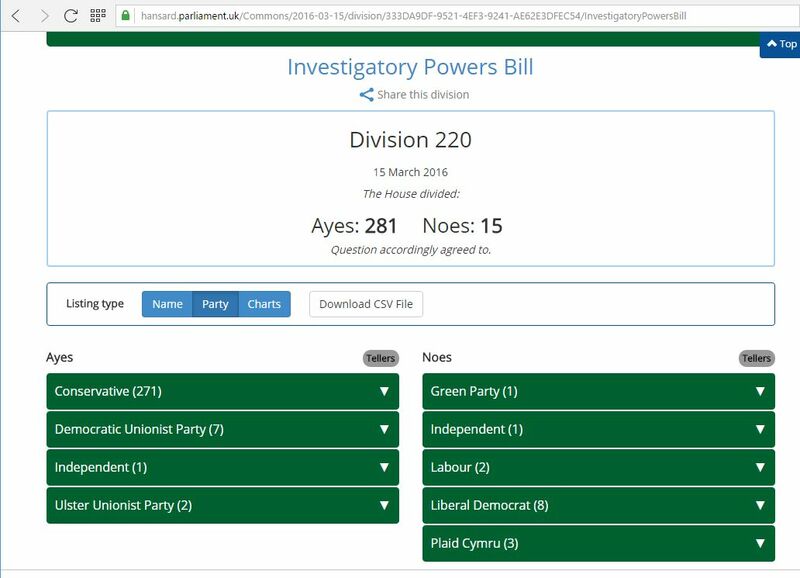 Well it didn’t get much support, but it equally got virtually no opposition, it passed on 281 ayes and only 15 nays as the majority of all the opposition parties simply didn’t bother to turn up to vote it down. So I’m going to hold all of the opposition parties just as responsible for it as the Conservatives and when they attack it remind them they chose not to oppose it. For those still in the “nothing to hide, nothing to fear” camp it’s worth noting that the USA has just given us an excellent demonstration of how quickly and unexpectedly a Government can change. Bills like this put into place a framework that can very easily be extended to cover far more than they were ever designed for. From a technical point of view once you have the mechanism in place for blocking specific sites, the content of those sites doesn’t matter anything can be added to the list. 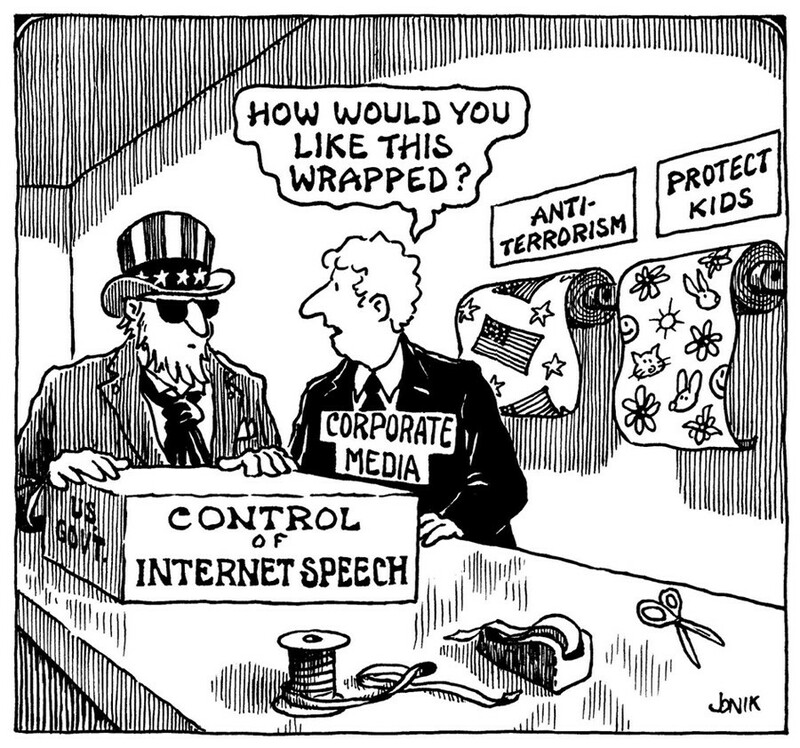 Once the Government can tell our ISPs that we can’t see one thing they’ve established the ability to prevent us from seeing other things as it suits them. For those of you thinking that if only we’d not voted to leave the EU they’d have saved us, well the EU has plans to “regulate” the internet as well. Thus it seems that we are stuck with being censored and snooped upon. So what is to be done? A tiny bit of thought suggests there is both good news and bad news. To implement what the government wants it will either in the large be easily circumvented or it will require far more in-depth snooping just to get the trivial information the law requires. The good news is that the deep snooping on everyone would be far more costly to implement so they’ll probably go for the easily circumvented method to be able to claim to have implemented the law. In either case we can take simple steps to make their work harder and to protect our privacy at the same time, sadly some of these things will require more technical knowledge than most people have. Which of course works well for the Government as the majority of people they can snoop on and the ones they can’t provide a much smaller haystack to look through. The easiest and cheapest way to make sure we don’t go to bad sites and to keep track of where we go is to put rules in at the DNS level. This allows the ISP to block bad sites cheaply and to log everywhere you might want to go at the same time. The good news is this can be worked round by simply not using your ISPs DNS servers, use Google or OpenDNs. Though they of course will also be subject to Governmental pressure so you’ll be better off using your own DNS or some other more privacy focused provider. Of course ISPs will at some point probably have t get round to intercepting such DNS traffic but that will be obvious and can be worked round with a few more steps. If they don’t go the DNS route, the next obvious choice is invisible web proxies, now these will obviously only work for web traffic but lets be honest that’s most things these days. At the proxy level they just look at what URL you’re requesting record it and block it as required nice and simple and again easily worked around. The simplest work around is use something like HTTPS everywhere. This forces your browser to use encrypted channels whenever possible, so a simple proxy can’t tell what you’re requesting and makes you more secure. The ISP can still tell what IP you want but if that’s on a content delivery network or a shared server that doesn’t tell them enough to block without causing a lot of collateral damage. If they want to know what’s going on in encrypted channels they have to do all sorts of expensive and dubious deep packet inspection type stuff which costs them actual money in terms of the hardware needed especially if they don’t want to make everything suspiciously slow. Once we get to this stage the defenses involve use proxy servers and VPNs in more friendly regimes and they’re getting few and far between. So the bill is horrendous, the opposition parties are useless and as bad as the Government, but chances are they’ll half arse the job and it will be easy to work around. Except of course if there are only a few people working round the problem they’re a much smaller target to take care of. Which probably means that no much will care enough to do anything, the Government will get away with it, another fence will be put in place around our freedoms and when we get a truly nasty Government in place that fence will be put to good use. At which point the opposition parties, Labour, SNP and the rest will be as culpable as the parties that voted it through. Tagged activism, censorship, Civil Liberties, freedom, internet, laws, politicians. Bookmark the permalink. That isn’t the half of it! Yeah I saw that after I wrote this, makes me wonder what else has been snuck through – the direction it’s all going is worrying sadly in the UK few of the alternatives seem to be any better – for as much as parties may complain about bills when in opposition they never seem to repeal them once in power.